Penang is one of my favourite family holiday destinations in South East Asia. There are just so many things to do in Penang. Plus there is a good variety of fun family Penang hotels. My favourite area within Penang to stay is along the northern beach of Batu Ferringhi. Most of the resorts along Batu Ferringhi were built in the 1960-70’s. However, over the past five or so years, they have all undergone renovations. Each of the Penang, Batu Ferringhi hotels caters for a different demographic. Some are great for families with toddlers, others offer fun zones for young children and/or teenagers. A few offer family suites while others just provide bedding configurations options. So which Batu Ferringhi hotels have got which family-friendly facilities? And what’s going to be best for you? This list of Batu Ferringhi Penang hotels is in order from the closest resort to Georgetown (a 45-minute drive away) to the furthermost along the main street – Jalan Batu Ferringhi. This is five-star luxury all the way. This Penang resort offers five different family-friendly rooms in the garden wing. The rooms come standard with small fridge, tea and coffee making facilities, ironing board and complimentary WiFi. Deluxe Garden View – 42 sqm has a king bed and some come with a sofa bed for one child. The balcony overlooks the lush gardens. Deluxe Seaview – 42 sqm with a king bed, some come with a sofa bed for a child. The balcony overlooks the sea. The Superior Family Seaview – 50 sqm has a king bed and a sofa bed for one child with a balcony overlooking the sea. The Deluxe Family – 60 sqm it has a King bed and two singles with a balcony overlooking the tropical gardens. The Garden Wing Executive Family Room – 76 sqm interconnecting two bedroom suite with balconies overlooking the gardens and pools. Tips 4 Trips wishes to thank Shangri-La Rasa Sayang Resort and Spa for allowing us to use this image. Ferringhi Grill – this is elegant dining and only allows guests seven years and above. Spice Market Cafe – the informal buffet where you’ll find a range of multicultural dishes. Pinang Resort and Bar (no, I didn’t spell that wrong) – for relaxing alfresco dining. The Shangri-la Rasa Sayang Resort has a family pool and separate adults-only pool and is situated next door the kids indoor fun park The Adventure Zone (fees apply). Located on the other side of the Adventure Zone is the Golden Sands Resort. As both of the Shangri-La resorts are connected to the Adventure Zone neither offer a complimentary kids club. We stayed at the Golden Sands Resort when my son was a toddler. We loved the toddler water slide and large undercover toddler splash pool. Since our stay, the Golden Sands Resort has added the Splash Pad – it looks like loads of fun with tipping buckets and water guns. For more entertainment, there is a full schedule of activities in and out the pool every day of the week. All the rooms at the Golden Sands come standard with small fridge, tea and coffee making facilities, ironing board and free WiFi. We chose to stay in a Hill View room as they were larger at 36sqm and added a rollaway bed. The Superior Seaview is smaller at 30sqm however, some of these rooms offer a Murphy bed (that is a bed that folds up into a closet during the day for more space). You will need to make a request for this on booking. For more space, there is the Executive Suite at 66 sqm and some come with the Murphy bed. During our stay at the Golden Sands Resort, we ate at both of the resort restaurants and the food was good. Garden Cafe – the buffet restaurant open for breakfast lunch and dinner. Sigi’s Bar and Grill – beach front dining inside or out, it is a fusion of pizzas, pasta, seafood, grills and Asian dishes. This old-style colonial Penang hotel dates back to 1948 and offers a touch of old world charm with modern amenities added during a revamp in 2010. It probably has some of the biggest hotel rooms along Batu Ferringhi. All the rooms at The Lone Pine come standard with small fridge, tea and coffee making facilities and ironing board. The Deluxe Room – 45sqm but only has a king bed or two singles. The Super Deluxe – 55 sqm and has a separate small day bed area. Premier – 52 sqm and has two queen beds. Premier Garden – 52 sqm with two queen beds and your own private courtyard opening out onto the resort gardens. Deluxe suite – 63 sqm with a king bed, separate day bed area a plunge bath on the balcony. Premier Suite – 77sqm with king bed and separate living area with TV. Grand Deluxe Suite – 89sqm super king size bed with large living and dining area not to mention the deluxe bathroom fixtures and plunge bath on the balcony. Grand Premier Suite – 118sqm two bedroom suite with a large living, dining and kitchenette area. Between your exhaustive stretches of swimming gently laps in the pool and reading your book, you’ll want to eat. The Lone Pine Hotel has two restaurants. Bungalow – all-day alfresco dining and it is where you’ll find your buffet breakfast. Matsu – casual Japanese grill. The Holiday Inn chain prides themselves on offering family friendly hotels. This two-tower Penang hotel is no exception. The towers are located on either side of the major road Jalan Batu Ferringhi. The Beach Wing and Ferringhi Tower are joined by a pedestrian sky-bridge, allowing safe access to the beach for those accommodated in the Ferringhi Tower. Ferringhi Tower Kid Suite – 68 sqm the room is partitioned with a King bed on one side and twin beds on the other. The kids also get the use of games console on their own TV. Ferringhi Tower Studio – 65 sqm large corner room with a king and twin beds all in one room. PlayLab/Kids Club – for younger kids, it has glow in the darkroom, lego, movie wall, arcade games and interactive games. Games Centre – the older kids are bound to love this place with its pool tables, table tennis, air hockey and more. Volleyball in and out the pool. Terrace Cafe – local and international foods. Lobby Lounge – light snacks. The Park Royal Penang Resort is currently in the last stages of a huge refurbishment due to be completed at the end of 2017. The pictures of the new modern looking rooms look inviting. Superior King – 28sqm with king bed, the sofa can be used for a young child. Deluxe Sea Facing Room – 30 sqm with king bed, the sofa can be used for a young child. Family Room – 38sqm with king bed and two singles. Lanai Suites – 48 sqm with king bed, two singles and separate living area. The recently renovated ParkRoyal Sea Facing Deluxe room. 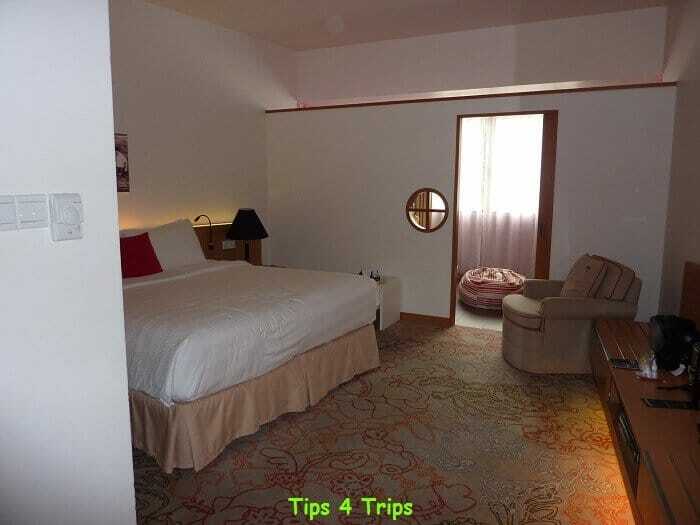 Tips 4 Trips wishes to thank ParkRoyal Penang Resort for allowing us to use this image. Cinnamon – all-day buffet and a-la-carte dining with local and international cuisines. Cool Bananas Poolside Cafe – pasta, pizzas and burgers. Uncle Zack by the Beach – al fresco seaside dining with a range of plates of seafood. Koko Nut kids club for ages 4-12 years (some activities are chargeable) with large indoor and outdoor playground. We had a rockin’ second family vacation in Penang at the Hard Rock Hotel Penang staying in their Lil-Rock Kid’s Suite (now called the Roxity Kids Suite), since our stay the resort rooms have been revamped. Apart from the very loud music that was played everywhere the facilities, food and rock memorabilia were wonderful. Roxity Kids Suite – 41 sqm with king bed and a separate kids room with single bed and trundle. The kids will love having their own TV, PlayStation, soft toys, books and free in-house movies. Please note: many people comment on Trip Advisor that the bathroom is small. Look it’s not large, but bigger than our really tiny bathroom at home. The room has a hill view and no balcony. It comes standard with small fridge, tea and coffee making facilities, ironing board and free WiFi. Roxity Suite with Courtyard – 53 sqm with king bed and a separate small kids room with single bed and trundle. Again the kids will have their own TV, PlayStation, soft toys, books and free in-house movies. The added bonus is the courtyard with mini toddler playground. The room comes standard with small fridge, tea and coffee making facilities and ironing board and free WiFi. Rock Star Suite – 93 sqm with king bed and sofa bed. Wake up and make your own Nespresso pod coffee in your kitchenette to enjoy in the separate living room watching the free in-house movies or using your free WiFi. King Suite – 185 sqm two bedroom suite with Hollywood king bed and standard king bed. Located on the ground floor with direct access to the pool and your own double-double car park – assuming you brought all four of your cars 😉 There’s a full-kitchen with Nespresso pod coffee, lounge room to watch the free in-house movies or use your free WiFi and complimentary access to the Rock Royalty Lounge. The Roxity Kids Club – the website says it caters for 4-12 years and the kids can put on concerts. Our experience a couple of years ago was it catered more for the real young ones. The TABU Teens Club – pool table, foosball tables and games consoles, teen concerts are also encouraged. The Swimming Pool – it was why I chose to stay here. It is the largest free-form swimming pool in Batu Ferringhi, has three waterslides all ages can use, splash park and water tubes for hire. Gym – I participated in the free weekly yoga class. Ultimate Monthly Foam Party – one for kids and one for adults. The Bayview Beach Resort is the last Penang hotel along the Batu Ferringhi strip. So whilst it is a little further from the capital of Georgetown it is closer to attractions like the Penang Spice Garden, Entopia by Penang Butterfly Farm, Penang Escape Theme Park and Penang National Park. My sister’s then young family stayed at this resort many years ago and really enjoyed it. Standard Room – 32 sqm with king bed (you can add a rollaway or baby cot). The room has a balcony with limited outlook. Superior Room – 33sqm with king bed (you can add a rollaway or baby cot). The room has a balcony with hill views. Deluxe Seaview Room – 33sqm with king bed (you can add a rollaway or baby cot). The room has a balcony with sea views and also has free WiFi. Grand Deluxe Seaview Room – 33sqm with king bed (you can add a rollaway or baby cot). The room has a balcony with breathtaking sea views and free WiFi. Family Room – 52 sqm with king bed and 2 single (you can add a rollaway or baby cot) – perfect for those larger families. The room has a balcony with hill views and free WiFi. Family Hillview Suite – 65 sqm with king bed and 2 singles in a separate partitioned room with living area. The room has a balcony with hill views. You also get free WiFi. Family Side Seaview Suite – 65 sqm with king bed and 2 singles in a separate partitioned room with living area. The room has a balcony with side sea views. Plus free WiFi. Family Seaview Suite – 65 sqm with king bed and 2 singles in a separate partitioned room with living area. The room has a balcony with sea views and free WiFi. There are lots of fun playgrounds for the little ones. The Outdoor Kids Playland with mini water slides, water fountain mushrooms, water whirlygigs and mounted water guns. The Indoor Kids Playground is perfect for those aged under seven years with its cushioned playpen. Water sports for bigger people. I highly recommend you extend your own research. Go to each to each of the resorts’ websites to get further details. This will help ensure the Penang hotel you choose meets your family’s requirements. Penang is located off the coast of Malaysia. Penang has its own airport, it is about an hours flight from Kuala Lumpur. Penang can also be accessed by road on one of two bridges from mainland Malaysia. One of the reasons I have enjoyed holidaying in Penang is that there are so many things to do and see in Penang. Click to get the The Ultimate Packing ListYou may want to pop your things into one of these lovely pieces of travel luggage. Once you have booked your holiday (I cannot stress this enough) book travel insurance. We use Cover More. Here are six reasons why you need travel insurance. These all look delightful and perfect for a family trip! I’d probably go with Shangri-La as I’ve had good experiences with them elsewhere! Can’t go wrong with Shangri-La Michelle – they never disappoint. All of these hotels definitely look and sounds like a lot of fun for the whole family!! #TheWeeklyPostcard! Hard Rock Hotels appear to cater for a range of demographics, Anisa. I know they are also popular with young singles and couples.